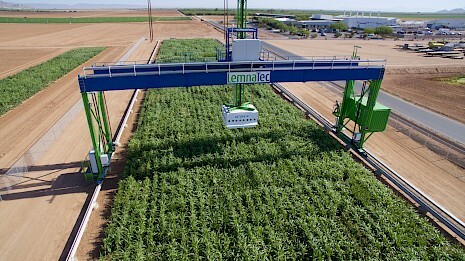 The Field Scanalyzer Gantry System is a 3-axis sensor-to-plant phenotyping system. The design and construction bases on an industrial portal crane system. The x-axis is guided along a rail system underpinned by concrete piles driven into the ground so as to allow natural drainage and no impediments as traditional concrete footings may act as flow barriers. In x-direction, length is only limited by the cabling requirements; one of our customer installations reaches 500 m length. The y axis is orthogonal to the rails and bears the lifting unit for the container with the sensing equipment. In y-direction customised width, e.g. 10 m, 20 m or 30 m is possible to span over a given growth area. The z axis serves to lift up and down the container with the sensor equipment. This setup will allow a precise movement of all 3 axes throughout the year. The sensor box can reach each point of the measuring area in pre-defined schedules with repeatable high precision in the sub-centimetre range. The system carries a sensor box for phenotyping sensors and environmental sensors. Any of the camera system will be housed in a separate weather sealed housing and mounted on a flexible and adjustable platform within the imaging box. The total payload of the camera box can reach up to 500kg allowing full flexibility for future adjustments and expansions of the sensor platform. The weather shielding of the sensor box protects the electronic equipment during harsh weather. This comprises a roller door at the down facing side of the platform to fully protect the sensors while not in use. Having environmental sensors on board, the Field Scanalyzer records climatic data during all phenotypic measurements so that users find phenotype and environment data linked in the database. 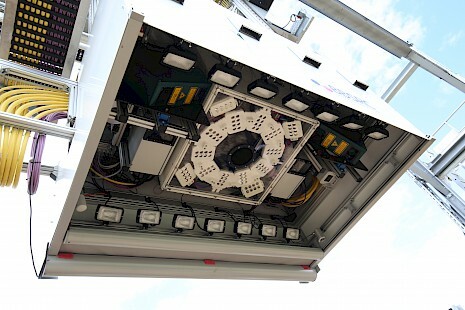 All sensors are mounted in a separate weather-proof cabinet which is moved over the field by the supporting gantry. The maximum total payload of the sensor bay is 500 kg which allows for additional sensors if required. The sensor bay contains a range of cameras together with dedicated illumination devices. It also contains equipment for sensing environmental data. Expemplary sets of sensors: Rothamsted and TERRA-REF configurations. Visible light imaging delivers photographs that can be processed for dimensions, morphology, and colour of the samples. They are widely used to monitor growth, development, or environmental responses of plants and canopies. Infrared imaging delivers images representing the heat emission from the sample surface. Such images can serve to measure canopy temperatures and can be related to transpirational processes. Hyperspectral imaging, also known as imaging spectrometry, is widely used in remote sensing. The FIELD SCANALYZER is able to image at close range (2.2 m above the canopy) and with high repeatability. Hyperspectral cameras produce a stack of images (hyperspectral data cube), where each image represents a narrow wavelength range of the electromagnetic spectrum. PS2 Fluorescence analysis addresses status and functions of the chlorophylls that are main components of the light harvesting complexes. The system emits an intense LED flash for 1 second during which 25 images are recorded. From these images variable fluorescence (Fv) can be compared to the saturation level of fluorescence (Fm) and used to assess quantum yield of the PS2 photochemistry. 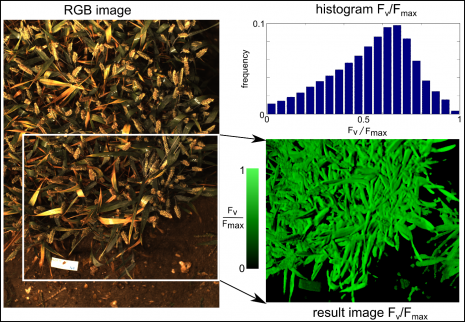 Laser Scanners are able to scan the plant canopy with very high cubicle resolution using an NIR Laser (840 nm) to ensure high reflectance by plant tissue and minimal physiologic interaction (eg chlorophyll excitation). Below is an example of coarse synthetic point cloud for field data, visualized with white points using shading for a better characterization. A height map can be extracted by encoding the height with colour. As phenotypes strongly depend on environmental influences, particularly when plants grow in a field, environmental sensors are important to deliver data on factors such as temperature or light. These environmental data are stored together with the camera measurements. This process may be used to propose the development stage of the wheat by analysing the size of the ears.